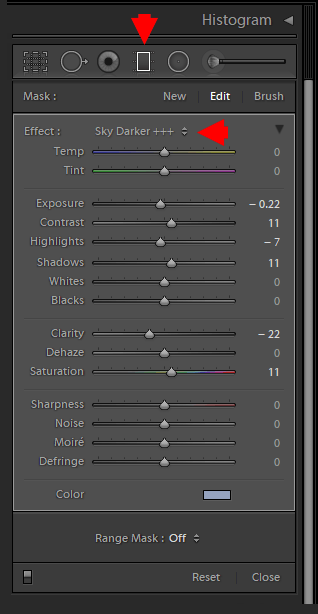 If I was to select the cornerstone functionality of Lightroom that defines Adobe’s RAW editor, I would, without hesitation, choose the ability to create presets. I am certain that you immediately assume that I am referring to the Develop Presets, which are responsible for the creative aspects of the photo editing workflow such as color treatment, contrast, or white balance. But the truth is, while the Develop Presets are incredibly important, they are only one small part of the entire concept behind Lightroom’s preset functionality. The preset functionality in any application allows you to save multiple settings and adjustments in the program so that you can reuse those settings and adjustments in the future. First, the presets allow you to save an enormous amount of time by automating certain functions of any digital workflow. Second, the presets help you to systemize the entire process. Lightroom relies heavily on presets in various modules and tools, which helps you customize and streamline your photo editing workflow regardless of if you are a hobbyist or own a large photography business. In my Lightroom editing workflow, I use 9 different types of presets that, without my Lightroom workflow, would otherwise be a complete nightmare. Let me demonstrate how I use the presets in different Lightroom modules. I consider the Import Module to be the main stumbling block for beginners who want to learn Lightroom. It is not very intuitive and has too many options available. Since it is not obvious which options are essential and which are not, it creates unnecessary complexity and confusion. The whole process can be simplified using three different types of presets. In my case, whether I am importing one photo or thousands into Lightroom, I spend less than a minute in Lightroom’s Import Module. The whole process is now mostly automated. The metadata is additional information that can be embedded into each photo. For example, the EXIF information (aperture value, shutter speed, ISO, focal length, etc.) is part of the metadata. The location where the photo was taken, keywords, and copyright information can also be stored in the metadata. Since I use Metadata Date Presets strictly for embedding copyright information, I often refer to them as Copyright Presets. My Copyright Presets consist of 11 fields of information that would be a nightmare to type in for every new import into Lightroom. 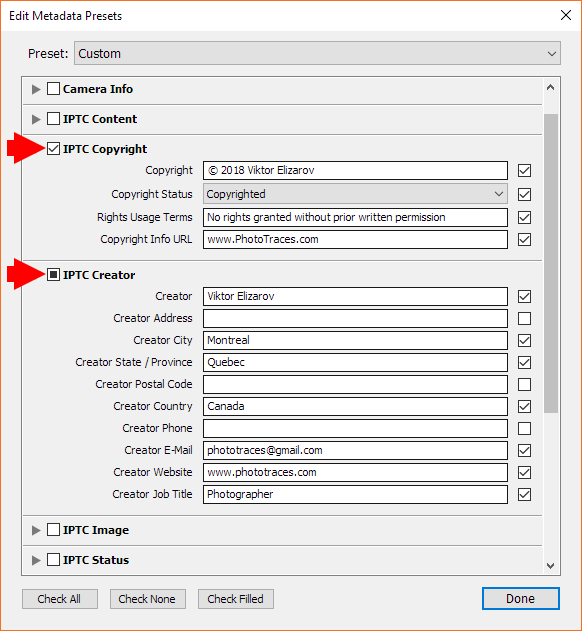 With the presets, however, I can apply the copyright information to all the new photos with one click or even without a click (see the Import Presets section). 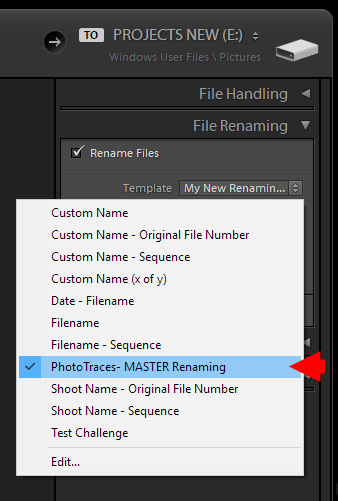 File renaming is an optional step when importing new photos into Lightroom. 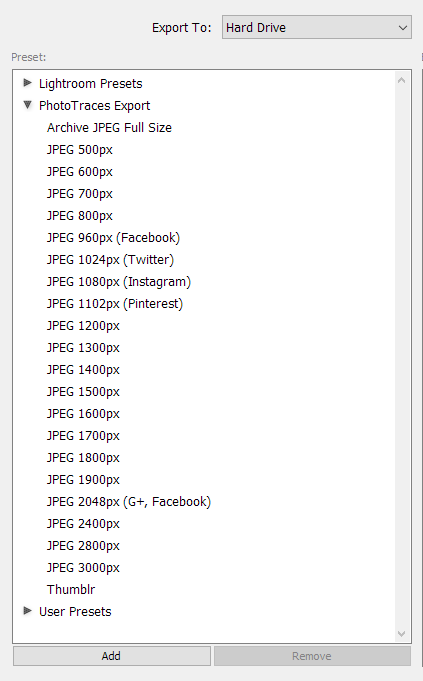 For me, it is also very helpful in my digital asset management (DAM), so I rename every single image. This name does not tell me much other than a sequential number and that the photo was taken with a Fujifilm camera. I need to open the photo in Bridge or Lightroom to gather more information about this particular image. Now, without opening the image, I can see the exact date the photo was taken and its location. Plus, keeping the original file name as the suffix makes it easy to reference. I use the File Renaming Preset I created years ago and apply it to all my photos during import. Once again and with only one click, I can apply the Renaming Preset during import and all my images in Lightroom have uniform file names. 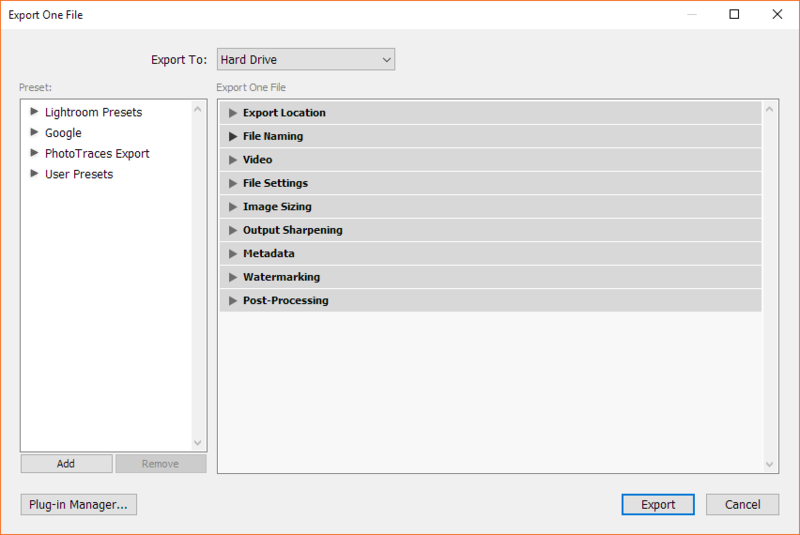 If the Metadata Presets and the File Renaming Presets streamline very specific areas of the import process, then the Import Presets are top-level automation. With the Import Presets, you can save a wide range of settings and options within the Import Module as a preset. You can also nest multiple presets inside the Import Presets. Nesting simply means that you can include multiple presets within another preset. In my case, I include the Metadata Preset and the File Renaming Preset inside my primary Import Preset. 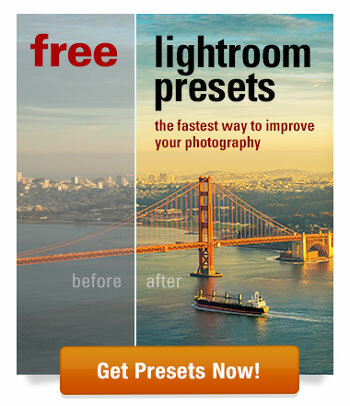 It takes only seconds and not much thought to apply this preset to all my new photos. Since the Metadata Preset and the File Renaming Preset are part of the global import preset, I do not have to worry about them. In essence, the Lightroom Library Module is a powerful digital asset management (DAM) tool. The goal of any DAM is to organize the digital files in such a way that it becomes possible to locate an image in your archive with ease. In the Library Module, you can search your image library using various search criteria. For example, you can search images by different attributes such as flagging status, edit status (edited v. nonedited), by rating (number of stars), by a color label, and so forth. 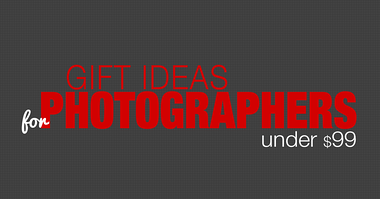 At the same time, you can specify search criteria based on the images’ metadata such as focal length, aperture, shutter speed, camera model, etc. On top of all this, you can combine multiple search criteria to create complex queries. The search criteria combinations become limitless. The Filter Presets allow us to save the search queries we use on a regular basis. with an aperture wider than F/2. This preset allows me to find all my current portrait work. The Develop Presets are the most popular presets in Lightroom and are, undoubtedly, the most fun. If most of the presets in this article are related to digital asset management (DAM), then the Develop Presets are directly related to the artistic and creative aspects of photography. My motivation for creating my first Develop Presets came after I realized that 80% of my editing steps are identical for every landscape photo I edit. I discovered that if I could save those repeated steps as a preset, I could potentially automate 80% of my editing workflow. The Develop Presets drastically transformed my photography by making it more streamlined and consistent. If you want to learn more about the concept behind the Develop Presets, I recommend reading my in-depth article: The Definitive Guide to Understanding, Using, and Creating Lightroom Develop Presets. When Lightroom was released in 2006, it had editing tools (exposure, shadows, contrast, etc.) that you could only apply to the entire image. The Local Adjustment tools were only added later to allow specific edits to affect only part of the image. At this point, Lightroom has three main Local Adjustment tools: Graduated Filters, Radial Filters, and the Adjustment Brush. The editing sliders for all three tools are very similar. 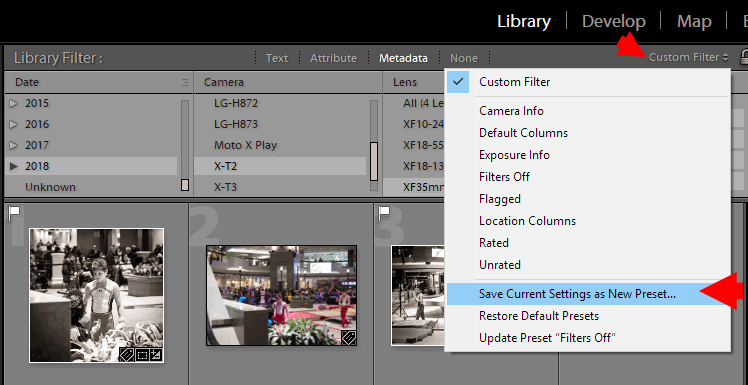 This means that you can save the editing settings as a Local Adjustment Preset that can be shared across all three tools. The Local Adjustment Presets are widely used when retouching portraits since the Filter Brush is especially useful in smoothing skin. Lightroom Creative Profiles are the latest addition to the preset family. Even though they are called profiles, they are very similar to the Develop Presets. You can look at the Creative Profiles as the next generation of the Develop Presets. They can include features that are not preset in Lightroom—like LUTs (lookup tables), and you can adjust the strength of the effect using the Amount slider, which works like the opacity functionality. Plus, the Creative Profiles affect the images independently from the Develop Presets. For example, if you apply a Creative Profile to an image, it does not overwrite the editing sliders of the Develop Module. This means that you can apply a Creative Profile at any time during the editing process and you can stack the editing effects of both presets and profiles. To learn more about Creative Profiles in Lightroom, check out my detailed tutorial: Demystifying Lightroom Profiles—In Depth Guide (Free Profiles). Lightroom is a RAW editor that uses nondestructive RAW editing. This means that Lightroom does not modify the original RAW images; it only creates temporary JPEG previews based on editing instructions stored in the metadata. This also means that any given photo has to be exported and converted to the desired format before it can be shared with the world. This is where the Lightroom Export Module comes into play. It allows us to export and save images in various formats in addition to performing a series of manipulations during the export process. To access the Export Module, right click on a photo and select the Export option from the menu. If we analyze the Export Module, we see that it has an enormous amount of options. We can export photos to a Hard Drive, to an Email, or to a DVD. We can rename images during export using the Rename Templates. We can resize images and apply different levels of sharpening. Plus, we can include watermarking. As you can see, if we were to specify the export setting each time that we export a photo, we would spend far too much time performing unnecessary repetitive tasks. We absolutely must take advantage of the Export Presets. The Export Presets are the second most important type of presets in my photography after the Develop Presets. In my workflow, I use only one Import Preset and one File Renaming Preset, but I have at least 30 different Export Presets depending on the final destination of the exported images. Please check out my in-depth article to learn more about Export Presets and how you can download a free set of presets that I use in my photography: Best Lightroom Export Settings for Web, Print, Facebook… (Free Export Presets). The final type of preset that I use in my workflow is the Watermark Preset. In general, I am not a big fan of watermarks. 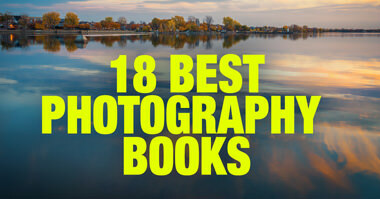 I believe that, in most cases, they ruin photos and their protective effect is questionable. The reason I use watermarks is for discovery purposes. If someone comes across one of my photos and wants more information about the photographer or how to purchase it, a watermark is very effective. You can access the Watermark Editor from the Export Module or from the main top menu EDIT > EDIT WATERMARKS. 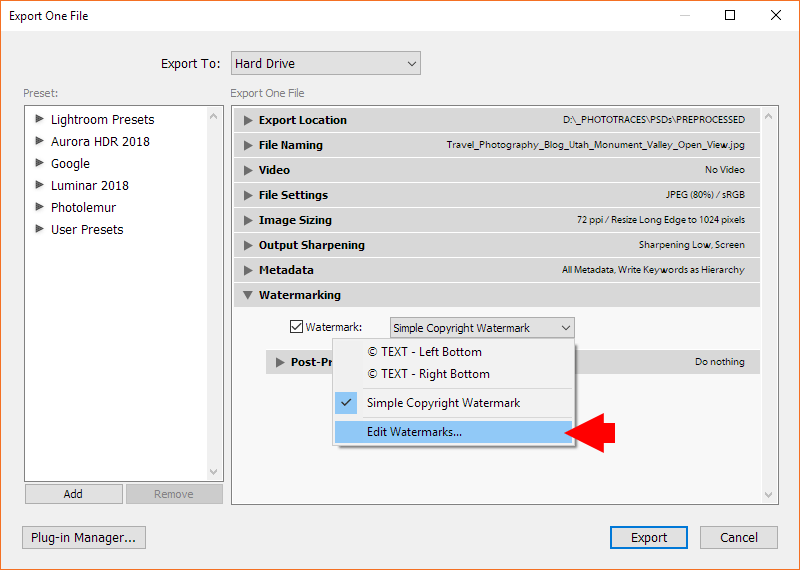 When you create a new watermark in the Watermark Editor, you can save it as a Watermark Preset and apply it to any given photo during the export process. In my case, I only have two Watermark Presets. Depending on the content of the photo, I select one of the presets to apply to the bottom left or the bottom right corner of the photo.